Opposition leader Henrique Capriles said an opposition march would go ahead in September. A referendum defeat for Mr Maduro this year would trigger a presidential poll. But a recall vote next year would see Mr Maduro replaced by his vice-president, meaning the Socialist party would remain in power. What has gone wrong with Venezuela? 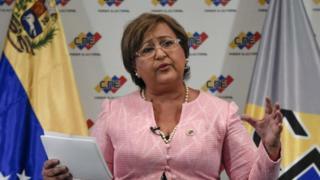 The National Electoral Council (CNE) president, Tibisay Lucena, said the opposition would be authorised in late October to try to collect petition signatures from the 20% of the country's voters, or 4m people, needed to start a recall referendum, on condition that "all the regulatory requirements are fulfilled". If the opposition was successful in gathering these signatures, the CNE would have a month to verify them. Ms Lucena said electoral officials would then have 90 days to schedule a referendum. Constitutional experts say this appears to make it unlikely a referendum would be held in January as demanded by the opposition. Image caption Opposition leader Henrique Capriles said the electoral council's announcement was a cynical move. The timing is crucial because according to the constitution, a vote to recall Mr Maduro this year would trigger a presidential election that polls indicate the opposition is likely to win. But if the president is defeated in a vote next year, the vice-president would replace Mr Maduro and the Socialists would thus remain in power. Election officials have already been accused of stretching out the first phase of the recall referendum where the opposition had to collect signatures from 1% of voters. The opposition accuses the government of dragging its feet while not totally rejecting the recall referendum process. Venezuela is suffering a severe economic crisis which the opposition blames on President Maduro. He says the economic crisis and efforts to get rid of him are a capitalist conspiracy.